Good Afternoon Beadin’ folks! 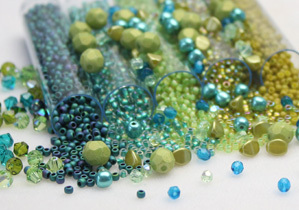 Happy to be here with Eureka Crystal Beads for another Project Blog for you! Today I’m going to show you a fun and quick Chain and Crystal Summer Necklace! Chain long enough for your desired finished length. (Keep in mind that the clasp and beads will add a few inches) I used: 10×11 Gunmetal Plated Steampunk chain. A toggle clasp. I used a TierraCast 18mm Antiqued Silver Plated Tapered Bali style toggle. Swarovski Crystal Beads! I used: 8mm Round Swarovski Crystals in Aquamarine and 6mm Round Swarovski Crystals in Light Azore. Click thumbnail images below to enlarge!! First, let’s add on our toggle clasp. To do this, you’ll need (2) eye pins, (2) 6mm Swarovski Crystals, your toggle, and both ends of your chain. Use your Chain nose pliers and open the loop of each eye pin. Attach the eye pins to the ends of the chain and use the same pliers to close them. Next, add a crystal to each eye pin and bend the wires (with your chain nose pliers or even just your fingers) so they are coming out at a 90 degree angle from the top of the crystal. Use your cutters to snip off about half of the wire on each pin. Lastly, use your Round nose pliers and roll a loop on both eye pins so that way you can fasten them to each end of your toggle clasp. If you need a refresher on rolling loops and making connections, check out my tutorial video on YouTube that shows this technique! Next, use your Cutters to snip the chain where you’d like a crystal added! Anywhere you’d like. Use a crystal and an eye pin to attach the chain back together using the same techniques from the previous step. Now, just add more crystals anywhere you’d like! I chose random spots throughout the necklace because I wanted an asymmetrical and random arrangement, but you can use as much or little of a pattern as you’d like. You can easily lay crystals along your chain FIRST before cutting to see if you’d like that placement. Previous Post Oh-So-Wonderful Peyote Rivoli Bezel!! Next Post JULY BIRTHSTONE: THE STUNNING RUBY!